Miomir Vukobratović was born in Botoš (Zrenjanin), Yugoslavia, in 1931. He received the B.Sc. and Ph.D. degrees at Mechanical Engineering Faculty, University of Belgrade in 1957. and 1964. respectively. From January 1958. he worked as a stress and flutter analyst at the Aeronautical Institute in Belgrade on problems of stress and aeroelesticity of the first Yugoslav military jet airplanes. From beginning of 1965. he works at Mihailo Pupin Institute in Belgrade, where he is director of Robotics Center. In 1980. M. Vukobratović was elected as a part-time full professor for group of courses at the Production Engineering Department of the Mechanical Engineering Faculty, University of Belgrade. Integral professional and scientific activities of Miomir Vukobratović can be shortly presented in three basic areas. The first one refers to his professional and research work in aeronautics, the second in the field of sensitivity analysis and dynamic control synthesis of large scale dynamic systems and the third, in the longest work period on the problems of theoretical and applied robotics (automatic derivation of dynamic models and synthesis of dynamic control) and special-purpose dynamic systems. Working on problems of aircraft flutter in the Aeronautical Institute at Belgrade he developed in 1963. an original method for calculating of the aircraft critical flutter speed. He studied the nonlinear effects in critical oscillations of aircraft structures which resulted in numerous publications and reports of the Aeronautical Institute, as well as, in his first defended Ph.D. dissertation: "Contribution to the study of nonlinear flutter" at Mechanical Engineering Faculty in Belgrade, 1964. In this area, in his research period (1959 – 1962), he elaborated a new method for the calculation of airplane critical (flutter) speed and, based on that, analyzed the oscillatory properties and calculated the critical speed of the first Yugoslav military jet plane "Galeb". Passing to the Mihailo Pupin Institute in January 1965. he starts to be engaged by another problematics: general sensitivity theory and sensitivity analysis of automatic control systems. In a relatively short time period he achieved remarkable scientific and professional results in the domain of limit cycle sensitivity of self-excitated regimes of dynamic systems. This relatively short research period was finished by a first, world recognized research monograph, written together with Prof. R. Tomović: General sensitivity theory, which was published in English (Elsevier Publ. Com. 1971., editor R. Bellman) and in Russian (Sovetskoe Radio, Moscow, 1972., editor Ya Tzypkin). His longest research period (more than thirty five years) was dedicated to work in robotics and control of large-scale mechanical systems. Basic scientific interest of this period was the activity in the field of robot dynamics and that of active spatial mechanisms in general. Together with Prof. D. Juričić he published first in the world seminal journal papers on the dynamics of anthropomorphic mechanisms (1968-1972). He defended by the invitation in 1972. in Moscow at Central Mechanical Engineering Institute of Russian (former Soviet) Academy his second D.Sc. work on Dynamics, Control, Stability and Realization of Anthropomorphic Active Mechanisms. In the period 1969 – 1973. together with D. Juričić, Miomir Vukobratović was introduced the ZMP concept based on which the problem of artificial humanoid gait modeling, as well as its dynamic equilibrium and stable regime are realized for the first time. In the same time period the semi-inverse method was introduced as a decisive step in nominal dynamics modeling of biped locomotion robots. Already thirty five years ZMP method is an unavoidable control procedure in the realization of steady state stable gait and dynamic balance with humanoid robots. 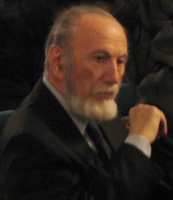 In the period (1971 – 1974) in the collaboration with his closest associates, M. Vukobratović has been introduced a complete dynamic approach for study of anthropomorphic locomotion robots and a control algorithm developed for the realization of stable functional movements in conditions of small and large system perturbations. Working on these problems M. Vukobratović in the cooperation of D. Stokić has founded dynamic control of manipulation robots and biped locomotion systems, including force feedback by means of which the possibility to minimize the suboptimaly of decentralized control of complete system was achieved. These results were published during the last twenty-five years in the most eminent international journals. During 1992 – 1996 M. Vukobratović with Y. Ekalo (Russia) established and presented in several journal papers new approach to the dynamic control of robots interacting with dynamic environment. Further results in the domain of problem solution of constrained robot motion interacting with dynamic environment Vukobratović with his close associates has been published in thirty five papers in leading international journals (1995-2004). The basic research results, M. Vukobratović as author or with coauthors, published in 222 international journal papers, as well as about 380 proceedings papers of international conferences, symposia and congresses. M. Vukobratović is a present and past member about of 110 international scientific and program committees of symposia and congresses. He is also many years member of editorial boards of ten leading scientific journals in robotics and automation, as well as co-editor of Book Series on New Frontiers in Robotics, World Scientific Publishing. Professor Vukobratović presented thirty one invited opening and plenary lectures on world conferences and congresses and lectured more then 155 scientific seminars in USA, Japan Russia, China and Europe. He is the founder and scientific leader of Belgrade school of Robotics. In the field of mechanics and control of robots and manipulators M. Vukobratović as a first author with coauthors published 15 basic research monograph versions and several advanced text books in English, many of which are translated into Japanese (3 monographs), Russian (4 monographs) and Chinese (4 monographs). With his coauthors Vukobratović published the world recognized, first in the world monograph series entitled: Scientific Fundamentals of Robotics in seven volumes, Springer-Verlag (1982-1990), and 13 chapters in international monographs. His second activity area belongs to the application of research results. In this area, in his first research period (1959 – 1962), he elaborated a new method for the calculation of airplane critical (flutter) speed and, based on that, analyzed the oscillatory properties and calculated the critical speed of the first Yugoslav military jet plane "Galeb". In 1963. M. Vukobratović and D. Juričić completed a large advanced study: Method for Calculating Oscillatory Behavior of Railroad Vehicles during Motion. The study was realized for the needs of B-56 Committee of the International Railroad Union, ORE. This study, together with the study Dynamics of a Four – Axle Passenger Railroad Car represented at that time the most complete results in the area of railroad vehicles dynamics. These methods were adopted and recommended as official calculation methods for railroad vehicles dynamics, by the International (European) Railroad Union. Third activity area refers to the professional leading of concrete robotic realizations. It should be pointed the first in the world artificial exoskeleton for restoring basic locomotor activity of severely handicapped persons, based on the idea of M. Vukobratović, his scientific and professional guidance and the collaboration with D. Hristić, has been designed and equipped at Mihailo Pupin Institute during 1971/72. After 1971, in the period 1971 – 1974 has been elaborated new type of electrically driven exoskeleton, further transformed in the first in the world active orthotic devices of modular type for dystrophic subjects. Headed by Vukobratović first in the world active arm orthosis for rehabilitation of advanced cases of dystrophy was realized and applied in Yugoslavia and abroad 1982. By his guidance first domestic anthropomorphic industrial robot (1978) as well as several other industrial robots (1979-1985) have been designed, realized and applied. During the last twenty five years M. Vukobratović is the most cited scientist in technical sciences in the former Yugoslavia region, one of a few world pioneers in robotics and one of a few the most cited authors in the world in technical sciences and robotics, particularly. Based on the official Citation index source only he and his coauthors were cited more than 1600 times, without taking into account the numerous citations in leading scientific journals of Japan, Russia, China and India. He has numerous national and international highest honours and awards for his pioneering works, and many years outstanding achievements in Robotics. Some of them will be mentioned. National recognitions: Full member of Serbian Academy of Sciences and Arts; president of the Academy of Engineering Sciences of Serbia; vice president of the Scientific Society of Serbia; “Nikola Tesla” first order medal, the highest national recognition in technical sciences; “AVNOJ” – the highest former Yugoslav award for the achievements in Robotics and Cybernetics; “7-th July” award - the highest prize of Serbia Republic (in former Yugoslavia) for his outstanding achievements in Robotics; holder of Saint Sava medal of first order, the highest award of Serbian orthodox church, for world pioneering results in rehabilitation robotics; dr. honoris causa of Univ. of N. Sad and Nis; “Nikola Tesla” first order medal, the highest national recognition in technical sciences 2002; “Karic Brothers” award 2002. in the field of science and research; The highest award of Belgrade City in Technical Sciences for 2003. The Association of Universities Professors and Researchers of Serbia has awarded the Plaque for Life Achievements to M. Vukobratović as his first holder. M. Vukobratović is one of five hundred Serbs who marked the 20th Century, Biographical Lexicon, “Serbs who Marked the 20th Century - Five hundred persons”, Belgrade, author and editor, M. Milanovic, 2006.
International recognitions: Foreign member of Russian (former Soviet) Academy of Sciences; full member of European Academy of Sciences; foreign member of Intern. Academy of Engineering, Moscow; “Big Golden Medal” first European holder of the highest recognition of the Intern. Academy of Engineering; foreign member of Russian Academy of Mining Sciences; full member of International Academy of Nonlinear Sciences, Moscow; a foreign member of Academy of Navigation and Motion Control, St. Petersburg; a full member of International Eurasian Academy of Sciences, Moscow; holder of the medal of outstanding engineer of Russia, awarded by the Presidium of Russian Academy of Engineering (first foreign holder); foreign member of Chinese and Japanese Academies of Engineering; honorary member of Hungarian Academy of Engineering; “Joseph Engelberger” the most prestigious award for outstanding results in applied research and education in Robotics, awarded by robotic industries association in USA; doctor honoris causa of Moscow State University named after Lomonosov, Moscow; doctor honoris causa of Universities of Temisoara and Craiova, Romania, honorary professor-adviser of Harbin Institute of Technology, China, etc. Prof. Vukobratovic is holder of the career award from World Automation Congress, AutoSoft-International Journal of Intelligent Automation and Soft Computing in 2006. His major interest is in the development of efficient computer aided modeling of robotic system dynamics, in particular dynamic non-adaptive and adaptive control of non-contact and contact tasks in manipulation robotics as well as dynamic modeling, stability and control in legged locomotion, especially humanoid robotics. Prof. Vukobratovic is holder of the career award from World Automation Congress (WAC), AutoSoft-International Journal of Intelligent Automation and Soft Computing in 2006. Prof. Vukobratovic is holder of the career award from World Automation Congress (WAC), AutoSoft-International Journal of Intelligent Automation and Soft Computing in 2006.